Motörhead are indelibly associated with their charismatic larger-than-life founder and front man Lemmy, one of British rock's biggest personalities. He built his ferocious reputation on uncompromising attitude and a party lifestyle that resulted in him becoming the personification of heavy metal (though he disliked the term, preferring to describe his music as rock & roll). Lemmy was fired from his previous band Hawkwind in 1975 and, adopting the title of the last song he wrote for Hawkwind, he formed Motörhead to play raucous, rock & roll. Initially this fell on stony ground with several unsuccessful singles, but they eventually broke into the UK top 40 with the 'Overkill' album in 1979 and built an avid live following. 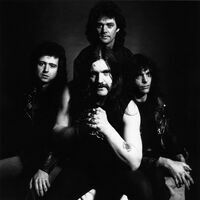 But it was the 1980 single 'Ace of Spades' that came to define Lemmy and Motörhead and the album of the same name became their biggest hit, reaching number four in the UK Albums Chart. They also captured imaginations with the 'St. Valentine's Day Massacre' collaborative EP with all-female rock band Girlschool and subsequently went to number one with the 'No Sleep 'Til Hammersmith' album in 1981. Despite personnel changes and a subsequent lack of hits, the legend of Motörhead continued with albums like 'Orgasmatron' (1986), 'Sacrifice' (1993), 'Snake Bite Love' (1998), 'Inferno' (2004), 'Kiss of Death' (2006) and 'The World Is Yours' (2010). In December 2015, after being diagnosed with prostate cancer, Lemmy tragically died just four days after celebrating his 70th birthday. The autopsy revealed prostate cancer, cardiac arrhythmia and congestive heart failure as the cause of death. A short time later, drummer Mikkey Dee confirmed that the band would not continue on without their front man and they officially disbanded. In January 2018 guitarist Eddie Clarke passed away at the age of 67 after a short battle with pneumonia. 2017 Silver Lining Music Ltd.